In March 2016 after flying the Parajet Volution 2 compact for three years I decided it was time for an upgrade. I was on the lookout for a strong, but also visually appealing frame with a powerful reliable motor. After much shopping around, and enquiring on forums I put the Parajet Volution 3 at the top of my list. The Volution 2 had served me well and had never let me down, therefore I was already a fan of Parajet. So after a little more research I decided to hit the buy button on the Parajet website. I chose the silver and blue option with a Vittorazi Moster 185 engine costing a total of £5,792.77 with delivery. 2-3 weeks passed, and so did another 2. I ended up waiting 6 weeks for the motor, but considering the demand that is still reasonable. I've visited the Parajet factory on three occasions and I can confirm that they are always very busy. The Parajet volution 3 was delivered by UPS in two separate boxes. The paramotor was in the first box well packed between padded polystyrene with a toolkit, and a petrol siphon hose. There was also a USB thumb drive containing the Vittorazi Moster 185 user manual. Opening box two revealed the cage well packed and wrapped in padded foam sheets. 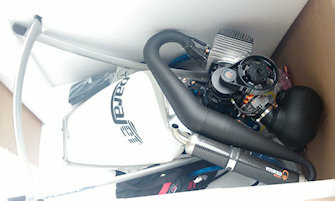 A quick inspection showed that the engine had been fired up in the factory for testing as mentioned by Parajet. And after reading the manual I was ready to take it out to my garden to run it in. I clipped the cage together and found that it fitted together much easier than the old Parajet Volution 2 frame. It uses the same connectors with a spring loaded locating pin which work very well. I've found that these locating pins can pop out sometimes after disassembling the cage so check them each time. Everybody has there own preferred way of fitting the cage but some ways are definitely easier than others. Slotting the two top pieces together and then attaching them, followed by the bottom sections seems to be the easiest. As I was fitting the cage I noticed something that had obviously slipped by Parajet's quality control. Pictured below is a saw cut in the frame. The person that was cutting the tube obviously started the cut in the wrong place, but decided to use the piece anyway. Considering the price that these cost I really don't think this piece should've been used. I also noticed five partly drilled holes from where the netting hole was nearly drilled in the wrong place. This was a bit of a let down and isn't what I'd expect from Parajet. Parajet got lucky as I'm not one to complain so I didn't return it, other customers might not be so nice. The frame is made from aluminium alloy 6082 which is a medium strength alloy with excellent corrosion resistance. Alloy 6082 is normally used in highly stressed applications like Trusses, Bridges, Cranes etc. The frame feels very strong and sturdy and has been able to handle a few bum landings without buckling. I've flown paramotors that feel like the frame is the wrong shape before, and this gets painful on longer flights. The Volution 3 feels totally different, and is very comfortable in flight. The tubes that run down between the pilot and the fuel tank seem to be the perfect shape against my back. The CNC machined blue anodised swing arms and engine plate really look the part and seem to be very strong. I also really like the Parajet logo that's been cut into the plate that's welded between the front and rear sections of the frame. This will act as a strengthener, but it looks really cool too! The V3 logo that's been stamped out of the back plate also looks great. These small things really set the frame off and Parajet's rigorous attention to detail has really paid off. The bottom of the frame protrudes slightly past the cage and has nylon feet to prevent the cage from getting chewed up on rough ground. I've learned to always tuck my trousers in as they can catch on these feet as you land and cause you to trip. The gooseneck bars pivot nice and freely on nylon bushes, and have plenty of adjustment for different weight ranges. 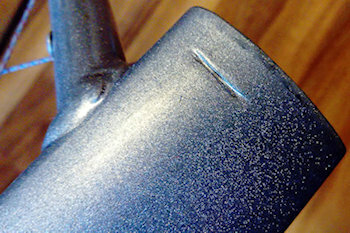 The brackets that fix them to the frame are super meaty and would be near impossible to bend. The hang points are very easy to adjust with just two bolts per side and are also very robust. The medium Dudek harness is very comfortable with a nice amount of padding all round. The buckles easily clip together and release with a simple squeeze, and the straps are very easy to adjust. There's Velcro sleeving on the top of the harness and down both sides to easily tuck your reserve bridals away. You can then attach the bridals to the chest straps which also have Velcro sleeving to neatly tuck them away. The ease of getting into the harness after takeoff is a definite improvement from the V2. I struggled to get into the V2 harness many times and know many other pilots that have the same problem. I don't even have to try with this harness, a simple wiggle and you're in, and comfortable. There's plenty of storage in the side pockets and I can easily fit my wing bag underneath the seat. I really like the shape of the fuel tank and way it fits perfectly into the frame. It holds a massive 14 litres of fuel giving about 3.5 hours flight time with the Vittorazi Moster. 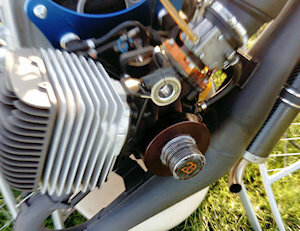 The fuel cap is easy enough to access but given its position it's quite easy to get fuel on the harness after fuelling. This is not really a problem, you just have to be a bit careful filling up. There are markings on the tank behind the seat to make it easy to see how much fuel you're putting in. This is important to know how long you'll be able to fly for. Unfortunately you can't see these markings in flight so you may have to set a stop watch. I usually carry a mechanics telescopic mirror in the harness pocket to see how much fuel I have left. There's quite a bit of guess work in this though as you can't see the markings, but it helps. Maybe the Parajet Volution 4 will have markings in a place that you can see in flight! The parajet throttle hasn't changed on this model but that's a good thing, I like it. It looks good and works great. I need to mention a problem with the throttle cable passing through the cage and hitting the propeller. This first happened in flight when I lowered my hand to let the blood flow back into it. Luckily it didn't pull the cable in and I carried on flying. The second time this happened is when I was sat strapped into the paramotor warming it up. I stood up to walk to the wing, and the propeller was still spinning fast. As I put my hands on the ground to push myself up, the cable passed through the cage again and the propeller chewed it to pieces. This recently happened to a guy flying a different brand, and the propeller pulled his hand in with the cable! You can imagine the damage caused to his hand. I made a cable myself and made it slightly shorter to make it less likely to pass through the cage. It could probably still happen so I have been very careful ever since. This is something else for Parajet and other manufacturers to look at with future models. The Vittorazi Moster 185 plus has always been very easy to start and usually fires up on the third pull. It runs clean, and is much quieter than the XT engine that I was used to on the V2. One big reason for choosing the Moster was the thrust that it puts out. To launch the V2 in zero wind I was having to run super fast while pulling brake to my knees to get off the ground. The Moster gets me off the ground so easily, it's effortless! I was quite disappointed to find out the you have to change the brass exhaust bush every 18 hours. This costs about £20 a time so it's already cost over £100. This is necessary as the bush wears out and breaks up. If left the exhaust can split, and will cost you even more. Although this is a pain, it is easy to change and only takes about 30 minutes to do the job. Update 22/6/2018 - These brass bushes now cost £30.48 inc delivery!!! I've noticed they're also wearing out sooner, my last one was broken up after 12 hours; so it's costing quite a bit to maintain now. Update 18/09/2018 - A company in the UK claim to have made exhaust bushes that will last 100 hours! Five have been handed out for testing before the dealer will start selling them. I will keep this post updated when more info is available. Update 09/11/2018 - Vittorazi have given us a sneak peak at the new Moster! The exhaust has been modified, and they claim the bushes will now last 50 hours!! The motor really impressed me for the first 80 hours, apart from changing the exhaust bushes and a few spark plugs I hadn't had to touch it. At 80 hours the airbox rubber started to split, this is a common fault and is caused by vibration. It was very easy to find on the UKPPG website, where I get all of my Moster parts from. And changing it was a simple job that only took a few minutes to complete. At 85 hours it really went downhill when a nice sunny September flight ended in an emergency landing. I was flying along and everything was fine, then suddenly I heard a loud whining noise. This noise was like a fan belt slipping on a car. The power dropped off and I immediately knew the belt was slipping. I was only a couple of minutes from my field so I turned and lined up for home. Suddenly I lost all power and had to make an emergency landing. I had lost the belt as expected, but I had also lost my propeller and the whole mechanism that was holding it on. The bottom pulley was also destroyed and I still have no idea how it got so badly chewed. So what had happened? Well, the one locking bolt that was supposed to stop this happening was still in there! The main bolt holding the eccentric had fallen out and was left sitting on the engine casing. It's hard to know exactly what happened but I'm not the first person that this has happened too. From discussing this with others we've come to the conclusion that it's simply caused by vibrations which loosen the bolt. The bolt falls out, the eccentric slips, your belt goes slack. You think it's just your belt so you don't kill the engine. Although the belt's slipping it's still spinning and then eventually it pulls the whole eccentric out. After searching for many hours I was unable to find the parts that I'd lost. It ended up costing me £790 to replace all of the parts, I once again bought them all from UKPPG. The owner of UKPPG, Nigel, was kind enough to assemble the eccentric and fit the bearings before sending it out. This made it very easy to fit, and the job was done in about two hours. This time I was sure to put plenty of locktite on the locking bolt that had came loose. I regularly check this bolt and advise anybody that buys a Moster to do the same. If you wish to tighten your reduction belt this bolt must be loosened, so make sure you use a locktite that can be removed. Launching the V3 feels great, as mentioned earlier the frame hugs your back making running feel very natural. The frame never hits your heels like some paramotors I've flown, and launching really is effortless. Once you're off the ground you pop into the harness with no effort and you instantly feel comfortable. The first time that I flew it I did notice a lot more torque steer than I was used to. This was probably due to the much more powerful Moster engine, I'd become accustomed to the V2's XT engine. I've just learned to lean into it, this is enough to keep it in a straight line even at full power. Besides this, In flight the Parajet Volution 3 handles very nicely. Weight shift works great, you can park your brakes and weight shift fairly sharp turns. Locking the V3 into some steep wing overs is effortless and feels very natural. And when it comes time to land the paramotor flies dead straight making landings easy. Tough frame capable of taking a good beating. 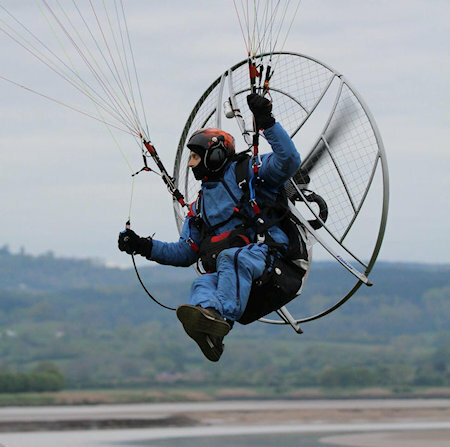 Visually pleasing paramotor with good attention to detail. Very transportable, breaks down to a decent size. Easy to assemble/disassemble cage, goes together in under 1 minute. Easy to launch and land, flies great. Comfy in flight, comfy harness, 3 hours in the air is a breeze. Great customer service from Parajet. Some imperfections on the cage. Throttle cable easily passes through the gap in the cage, this needs resolving. Damaged netting is not easy to replace. High maintenance, the brass bush problem needs correcting. High vibration causes lots of problems. Would I buy again a Parajet volution 3 again? I'd definitely buy a Parajet Volution 3 again! As for the problems I've listed... The imperfections to the cage are minor problems but if it happened again I'd probably complain. This shouldn't happen on such a high priced unit. 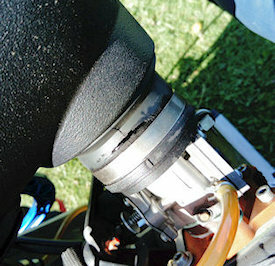 The Throttle cable problem is happening on lots of paramotors so changing brands wouldn't help. Until something is done about this we just need to be very careful. The damaged netting was my own fault, but these things happen, the netting should be easier to replace. I had to drill out the pop rivets which is a fairly easy task, but Parajet need to understand not everybody has the ability. Some people would have to take their paramotor back to Parajet to get netting replaced. Would I buy a Vittorazi Moster 185 again? The Moster has had a few problems, but it isn't terrible. There are some really bad motors out there that make the Moster look perfect. Recently, I've seen Vittorazi putting a lot of work into the latest models, so although I wouldn't buy this 2016 model again, the newer motors are looking good. I understand all engines will need maintenance eventually, but when you have to change bushes every 18 hours to stop the exhaust falling apart, it's definitely not ideal. In the summer I can do 18 hours in about 9 days so this really isn't that long between changes. Vittorazi have shown us some images, and the newer engines have extra springs and larger bushes. They claim the bushes will last 50 hours, which is a massive improvement, and something I could deal with for an engine that's otherwise really good. So yes, I will buy another Moster 185 in the future! The Parajet Volution 3 is a great paramotor, but if I ever buy another I'll choose the updated Moster 185. Parajet have impressed me in the past with great customer service. I was able to take my V2 into the factory without even booking in, and they put new pulley bearings in there and then, no messing. They are always very helpful on the phone and I wouldn't hesitate to buy from them again. Thanks for checking out my Parajet Volution 3 and Vittorazi Moster 185 review. If you liked this review stay tuned for more reviews on paramotoring products coming soon. Learn how to minimise the risk of a paramotoring accident happening to you > HERE. My full guide on buying your first paramotor > HERE < and your first wing > HERE. Discover the best ways to transport your equipment to the field > HERE. 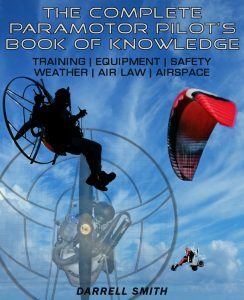 Take up paramotoring, or ultralight aircraft flying? And the super strong carry rack for a paramotor that will fit on your vehicles towbar > HERE. 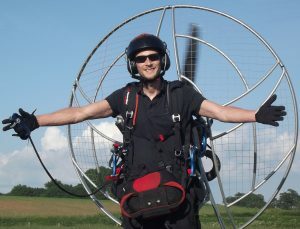 Sunt interesat de un paramotor si ma bucur ca am gasit acest manual care trateaza cam tot ce tine de zborul cu un paramotor. Multumesc!